advanced profiling tool. 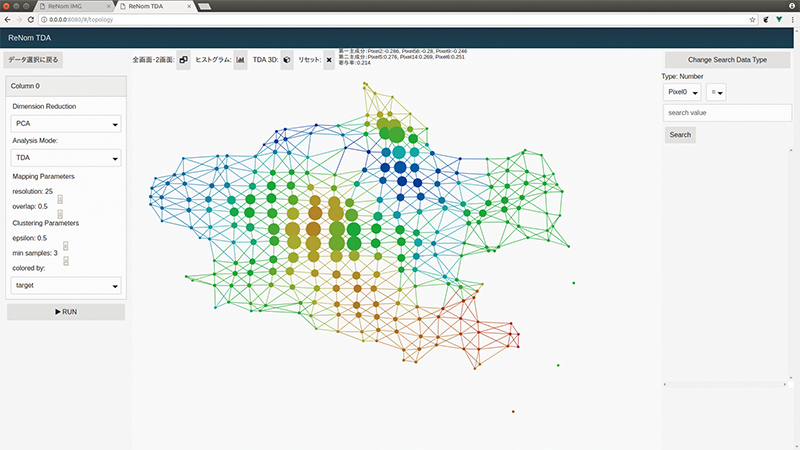 For example, by visualizing the connection between complex data, users can analyze various data such as customer data analysis, machine data analysis, financial analysis, unauthorized access, and cyber security analysis. data to toplogical space, features that are lost during dimentional reduction can be obtained. Topological geometry is the field of mathematics that focus on the property of a shape even, when it deforms continuously, and the connection it has in topological space, where distance has no importance. Unlike traditional geometry, length and angle are not considered as features, thus the expression that the data has can differ from tradional method. By projecting data to toplogical space, features that are lost during dimentional reduction can be obtained. projecting data on the axis that can keep the data volume as much as possible. information of variables not following the axis are lost. What does TDA do ? “ReNom TDA” can reduce dimensions while maintaining the connections of data in high dimensions, thus data characteristics which were hard to visualize in traditional methods, can be visible. With GUI-based web applications, users can compare results based on different algorithms using ReNom TDA. For example, users can compare TDA result – which was acquired from a certain dimensional reduction – with other dimensional reduction methods. Moreover, parameters in the GUI can be selected to run unsupervised classification such as K-means, or supervised classification such as K-Nearest Neighbor, or Random Forest. not work. A rough correct classification has been acquired using K-means based on TSNE.AutoEncoder+DBSCAN was not able to classify properly. 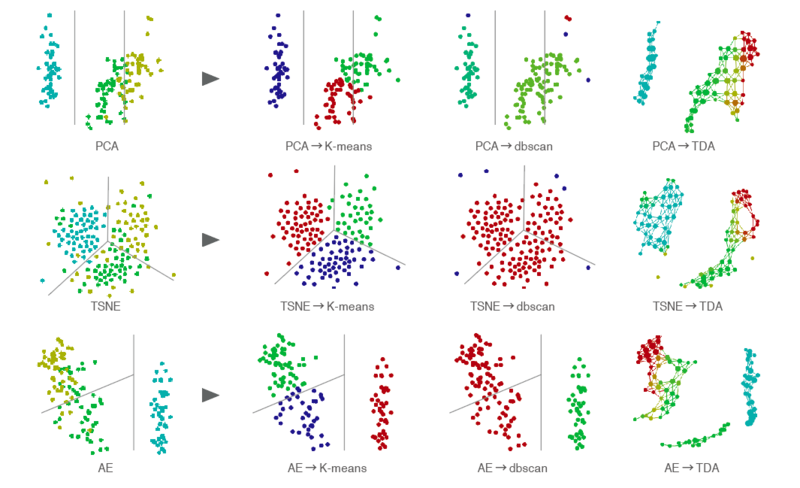 On the other hand, the points that have undergone TDA have already been grouped into one class with yellow color appearing between the red and green sections, near the border of the clusters which represents existence of multiple mixed class data. Instead of clarifying the classification boundary, ReNom TDA gives users opportunity to think about the meaning and classification of such data. Users can visualize the graph structure of the TDA result with web application, by reading CSV file and setting the parameters, thus visualizing and analyzing data can be conducted without programming.